Dry room System – Thai Takasago Co., Ltd.
……………Moisture in the air is an impediment for the manufacturing processes of the rapidly increasing rechargeable lithium ion batteries and organic EL. ​Their manufacturing is therefore performed in a Dry Room®, which has the moisture in the air removed in a controlled low dew point atmosphere. ……………WINDS® is an original energy saving type dehumidifier which supplies dry air with a dew point temperature of -60°C. We use it to offer our low ​dew point Dry Room®, which achieves the highest level of energy conservation in the industry. 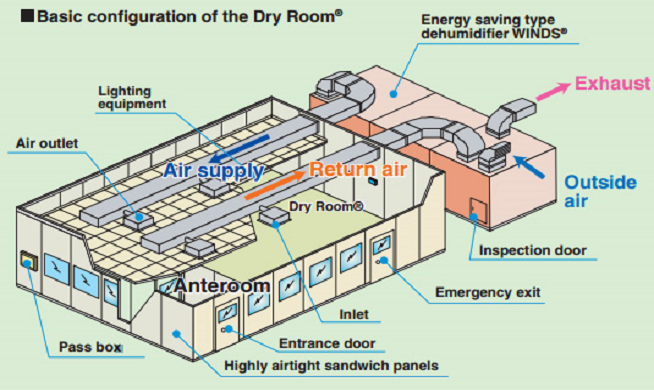 ……………The manufacturing cost for the dehumidifier air used in the Dry Room® is higher than for the conditioned air used in ordinary air conditioning. There are therefore increased demands for energy conservation in large scale mass production factories. In order to respond to there demands, we optimize the configuration of the dehumidification equipment to acheve reduced energy consumption and lower costs. Furthermore, we achieve further reduction in energy consumption by implementing optimal operation controls to deal with the periods when the dehumidification load is low, for example during the winter months.